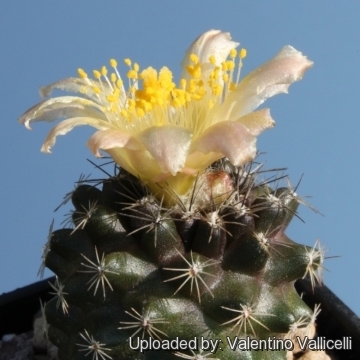 Habitat: This is the most northerly Copiapoa known to exist today that inhabit the extremely dry hills near Tocopilla. It grows deep seated within rock crevices and is very difficult to find. Its survival is seriously threatened both to aridity and human activities (many small mines on the coastal hills, south of Tocopilla). Despite the lack of rain where it lives, the extreme aridity is attenuated by the frequent, often dense, coastal fogs. The fog tends to concentrate in the form of a cloud band at an estimated height of 500 to 850 m. It shows a recurrent pattern; usually it is overcast in the early mornings, the clouds dissipating during the late morning and returning during the late afternoons. It grows together with Neoporteria residua, Eulychnia aricensis, Eulychnia iquiquensis, Eriosyce laui, Neochilenia iquiquensis, Neochilenia saxifraga, Trichocereus deserticolus, Cumulopuntia sphaerica, and Eriosyce recondita. Copiapoa humilis f. cristata hort. Copiapoa humilis var. paposoensis (F.Ritter) A.E.Hoffm. Copiapoa humilis var. longispina (F.Ritter) A.E.Hoffm. Cactaceae Syst. Init. 16: 6 (11 Oct. 2003). Copiapoa humilis subs. tenuissima f. cristata hort. Copiapoa tenuissima f. cristata hort. Copiapoa humilis subs. tenuissima f. monstruosa cristata hort. Copiapoa tenuissima f. monstruosa cristata hort. Copiapoa humilis subs. tenuissima f. monstruosa hort. Copiapoa tenuissima f. monstruosa hort. 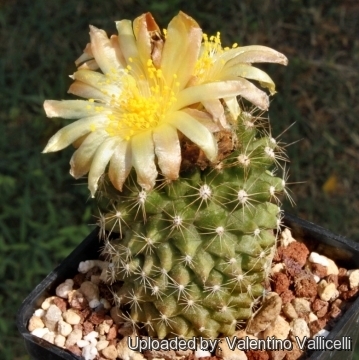 Description: Copiapoa tocopillana (now considered a subspecies of Copiapoa humilis) is a tiny cactus with white, woolly heads. 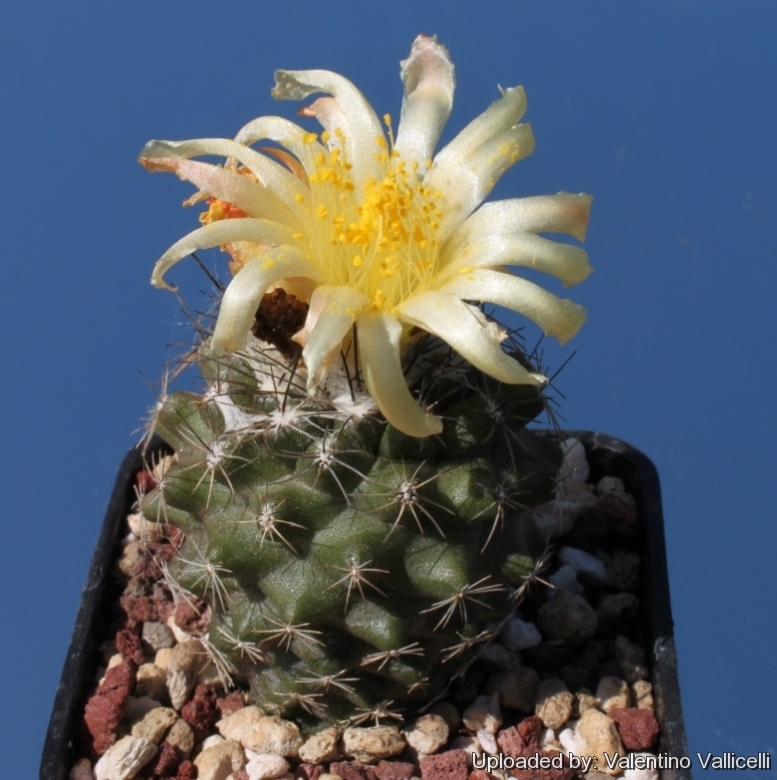 It is the most northern Copiapoa, as well as one of the least attractive, it is a very uncommon plant rarely seen in collections. Stem: Glaucous-green to greyish green, globose to short cylindrical (approx. three times longer than broad), densely covered by spines. Apex white-woolly only in adult plants. Root: Napiform single or branched, firm, 10-30 cm long and 2-3 cm wide, with a narrow neck about 10 cm long. Ribs:* (7-) 10-14, barely evident in young plants, forming distinct spiralling tubercles. Tubercles: Rounded-obtuse 4-6 mm long and wide, sometimes with a keel under the areola. Areoles: Round 3-5 mm in diameter, grey felted, 5-10 mm apart. Spines:* 1-3 cm long, acicular, straight to slightly curved upward, maroon or blackish, with whitish bases. Radial spines 10-12, all almost the same size 10-25 mm long. Central spines: 1-4 only slightly stronger, 1-4 cm long. Flowers: Diurnal closing at night, scentless, protracting the period of opening many days, lemon yellow, 2,3-2,5 cm long. Ovary almost spherical, 3,5-5 mm in diameter, pale, with 0-4 coffee-red scales evenly distributed, short and narrow 3-5 mm long and 0, 5-1 mm wide, hairless or with small tufts of woolliness. Tubular nectaries 1-1, 5 mm high, narrow at the base of the Stamens. Tube funnel-shaped 7-8 mm long, inside bright yellow outside, pale with few coffee-red narrow scales, 7-10 mm long, 2-3 mm wide, hairless. Filaments yellow 5-7 mm long, the of upper ones more short. Anthers and pollen golden yellow. Style bright yellow, 10-12 mm long with 6-7 yellow stigma lobes 2-3 mm long. Tepals lemon yellow, with a reddish-brown mid-line on the outside all 10-12 mm long, 2,5-4 mm wide, short to long somewhat lanceolate and narrow. Seeds: 1,4 mm long, 1 mm wide, 0,7 mm broad. Testa black, glossy, almost smooth or finely tuberculate; Hilum oval, whitish. Remarks: Copiapoa tocopillana is strictly related with Copiapoa humilis but the latter distinguishes for its softer darker coloured body, growth more flattened, ribs more high, flower larger with strong fragrance, ovary always glabrous, with smaller scales inserted only above the peripheral ring, nectaries more large, wider and more open, stamens more long, lobes of the stigma more numerous and seeds more wide. Copiapoa humilis f. cristata hort. : Crested form. Copiapoa humilis subs. tenuissima (F.Ritter ex D.R.Hunt) D.R.Hunt: is a geophytic cactus arising from a large tuberose root that can slowly branch from the base to form small clumps. Distibution: South of Antofagasta. Copiapoa humilis var. tocopillana (F.Ritter) G.J.Charles: stem usually solitary, glaucous-green to greyish greem, globose to short cylindrical. 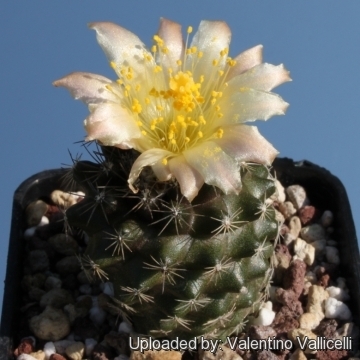 Distribution: Antofagasta: (Tocopilla) It is the most northern Copiapoa. Copiapoa humilis subs. variispinata (F.Ritter) D.R.Hunt: has unusual green body. It form clusters that are wider than hight. Distribution: Quebrada Izcuna on the south of Caleta Botija, between Paposo and Blanco Encalada about 50 km north of Paposo. Copiapoa leonensis I.Schaub & Keim: Related with C. humilis and C. hypogaea, has small greysh stems ( max. 5 cm) with a strong taproot. Flowers yellow-orangish. Spines long and stout. Distribution: Quebrada el León, Atacama, Chile. Copiapoa maritima Kníže: has dark body and off-setting freely. This plant corresponds to Copiapoa humilis subsp. humilis, and the town of collection mentioned (Paposo) is the type locality of this species. Watering: Water moderately from Spring to Autumn, but do not overwater (Rot prone), it must be strictly kept dry throughout the winter quiescent period since it is very sensitive to any moisture excesses keep dry in winter. Hardiness: They need to be kept in a cool place during winter rest and are resistant to light frost if kept on the dry side prior to, and during, cold weather ( they are hardy to -4 C ° C short periods). However some warmth throughout the year will increase the grower's success (minimum 5° to 8°C during rest season). - Sciara Flies: Sciara flies are one of the major problems for seedlings. It is a good practice to mulch your seedlings with a layer of grit, which will strongly discourage the flies. Propagation: Seed, cutting, grafting. Seeds germinate in 7-14 days at 21-27° C in spring, remove gradually the glass cover as soon the plants will be well rooted (ca 1-2 weeks) and keep ventilated, no full sun for young plants!